Chiyoda Kōgaku Seikō was relatively late to start making its Minolta 35 Leica based 35mm rangefinder camera, beginning in May 1947. Up until then, Chiyoda had specialized in medium format rollfilm cameras such as the Semi Minolta folders and Minoltaflex TLRs. Eventually, Minolta would even cooperate with Leitz to build rangefinder cameras, such as the Leitz Minolta CL. The Minolta 35 appeared similar to the Leica III with which it shared a common Leica-thread-mount (LTM) interchangable lens mount. The Minolta 35 featured a horizontal cloth focal-plane shutter with speeds T, B, 1sec to 1/500sec, separate shutterspeed dials with a front dial setting speeds below 1/35sec, and a knob advance. Unlike the other Leica copies whose shutters were based on the original Leitz two post, co-axial drum/pulley mechanism, the Minolta used a four-post (two pulleys and two rollers) design similar to the Exakta shutter. It pioneered some features beyond its German contemporary in that it had a combined rangefinder/viewfinder window and a self-timer. Its integral film take-up spool and hinged back door enabled easier film loading than on the Leica. 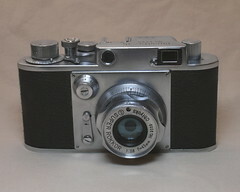 The Minolta 35 was manufactured from 1947 to 1958. There were nine significant variations during this period. The early Minolta 35 underwent almost continual development from models A to D, and these versions are hard to tell from another since the model names are not marked on the camera, various changes seemed to be 'softly' introduced during production and their serial numbers were sequential without breaks. From the model E on, the model names were engraved on the front plate of the camera. All versions had the name 'Minolta - 35' engraved on the top cover. The logo engraving on the top cover of the model A and early model B read 'Chiyoda Kogaku' 'Osaka', and these models may be engraved with 'Made in Occupied Japan' on the bottom cover. The model A can be confirmed by measuring its 24×32mm shutter mask opening in the film chamber. For the Minolta 35, the physical rangefinder base between the front viewfinder window and rangefinder window was 40mm. On the earliest models the finder magnification was only 0.33, yielding an effective rangefinder base of just 13mm and leading to focusing difficulty. Later model A bodies have a slightly different set of slower speeds '1, 2, 4, 8, 25' in stead of '1, 2, 5, 10, 25' on the slow speed dial. The change is said to have taken place prior serial number 0900. Another change that needs to be mentioned is the disappearance of the small latch above the slow speed dial on later model A bodies. first version of the 45mm f/2.8 Chiyoko Super Rokkor standard lens, with 5 elements in 3 groups. This version featured a small round window in the front bezel to read aperture. 8.5cm f/2.8 Chiyoko Super Rokkor 85mm portrait lens. 11cm f/5.6 Chiyoko Tele Rokkor 110mm short telephoto lens. 13.5cm f/4 Chiyoko Tele Rokkor 135mm telephoto lens. During model B production the shutter mask opening increased to 24×33mm from 24×32mm. The logo engraving on the top cover changed to 'C.K.S.' (Chiyoda Kōgaku Seikō) during the model B production run, and remained so marked until the model II type B. Shutter speeds or the slow speed numbers on the dial read right-side-up from front of the camera, when one is facing the camera. Some model B may have CPO marking on the winding knob (two variations are known: Latin alphabet or Japanese alphabet Katakana). Changes for the model D include strap lugs, the rewind lever located to under the winding knob, and an indent into the front plate below the lens mount to make clearance for the lens' focusing tab. The image size of the model D is nominally 24×34mm, and is said to vary between 24×33.5mm and 24×34.5mm. This image size remained until the model IIB was developed. second version 45mm f/2.8 Chiyoko Super Rokkor standard lens, with focusing tab but without front bezel aperture window. Model E is now engraved on the front plate of the camera. The main differences from model D are the addition of a diopter adjustment on the finder, and the addition of a flash sync plug on the right rear of the finder cupola. The main difference is the opening of the hinged back: on models A through F, a small button in the bottom plate is pressed to open the back, whereas on model II, there is a circular latch with 'Open' and 'Shut' or 'Close' engraving. 2.8cm f/3.5 Chiyoko Super Rokkor 28mm wide angle lens, 6 elements in 4 groups. 3.5cm f/3.5 Chiyoko Rokkor 35mm wide angle lens, 4 elements in 3 groups, with focusing lever. 5cm f/2.8 Chiyoko Super Rokkor 50mm normal lens, 5 elements in 3 groups, with focusing lever. 5cm f/2 Chiyoko Super Rokkor 50mm normal lens, 7 elements in 4 groups, with focusing lever. Minolta 35 II "type a" no.49752, with Super Rokkor 45mm f/2.8. This model is very similar to model F. There are variations amid model II type a: there are two different type of backs (not compatible), one with a squared, smooth pressure plate, the other one with a larger, rectangular black pressure plate. At some point in time, the sync speed X was added between speeds 8 and 25. X sync speed on slow speeds dial). The logo engraving on the top cover read 'Chiyoda Kogaku'. The overall shape of the camera is more angular with a revised shutter speed dial pedestal flush to front of camera, shallow platform under rewind knob, and deeper top and bottom cover flanges. Compare model II type a and model II type b to see cosmetic changes. Not to be confused with Model IIB. Not to be confused with Model II type b. The main change is the addition of a advance winding lever (instead of a knob). The magnification of the finder improved to 0.8, and the effective rangefinder base became 32mm. Image size finally developed to 24×36mm. There were cosmetic changes as well as technical changes. The exposure counter center of the advance lever and both speed dials were finished in gloss black, the rewind knob was knurled and kerfed. The 'Minolta - 35' font changed to match Minolta's 1955-82 font style. The logo on the top cover read 'Chiyoda Kogaku' in small font. 5cm f/1.8 Chiyoda Kogaku Super Rokkor 50mm standard lens with 6 elements in 5 groups. 10cm f/3.5 Chiyoda Kogaku Tele Rokkor 100mm short telephoto lens. 3.5cm f/1.8 W. Rokkor QF wide angle lens. ↑ JCII/Lewis, ed. "The History of the Japanese Camera" p192. ↑ Sugiyama/Naoi "The Collectors Guide to Japanese Cameras", code numbers 3420-27, 3429. ↑ article in Photo Deal II/2007 p17. ↑ Minolta 35 LTM lenses had 'Chiyoko' logo until 1956-58. ↑ Logo changed from 'Chiyoko' to 'Chiyoda Kogaku' for Model IIB LTM lenses. See also Minolta Super A regarding 'Chiyoko' and 'Chiyoda Kogaku Super Rokkor' bayonet-mount lenses. ↑ Cooper, "The Minolta Manual" 1959 p24. Minolta 35 at Antique and Classic Camera Web Site.